THE FIRST ANNUAL ABC FUN(D) RUN! May 10, 1997 - Anchorage, Alaska! KIDS + BIKERS + SHRINERS + ANIMALS = ??????? Touch the heart of a Biker and you could end up with putty in your hands! Many is the time that one or more of us have seen the biggest, burliest, roughest "biker dude" just melt when faced with a youngster who is in trouble of some sort, or who has physical, mental, or emotional disabilities. Hardened hearts soften, craggy smiles break out, pockets empty, and life gets just a little sweeter! Kenai Peninsula ABATE (Alaskan Bikers Advocating Training and Education) was recently approached by one of their members who also just happened to be a Shriner. Would we, could we consider doing some type of a run in order to raise funds for area children who are in need of the help that Shriners hospitals provide? A filmstrip was shown of similar runs in Oregon and of the children those runs benefited. Yep, look around, smiles and encouragement were beginning to pop out all over the room! A plan was made - a date was chosen (May 10, 1997), and then the work began in earnest. Other ABATE organizations in the state were contacted, as well as other motorcycle organizations. 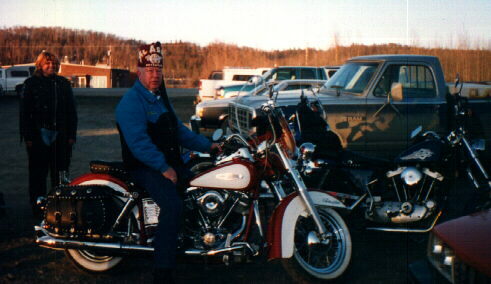 The Shriner/Biker began going from town to town to talk with various groups to garner further support. Media representatives were contacted in order to further get the word out. Chamber of Commerce meetings were attended and announcements were made via their newsletters. A parade route was chosen ... we would form up at the Park Strip in Anchorage and parade through town to the Columbia Alaska Regional Hospital where we would be met by the Al Aska Shriners who were treating children who needed their help (one of the three times each year that this is done). The results of many months of hard work? Lots of cooperation! Many motorcycle organizations became involved. In the parade in Anchorage were members of the Red Riders Association, the Gold Wing Road Riders Association, Women on Wheels, Vietnam Vets, Red and White, Anchorage ABATE, Chugiak ABATE, Kenai Peninsula ABATE, Glacier Riders, Harley Owners Group, and the Ladies of Harley, as well as several riders who are not attached to any group or organization. Approximately 100 motorcycles and trikes, some with riders "two-up," one with a side-car occupied by Rosie the Golden Retriever, participated in the parade. Upon arrival at the hospital we were met by members of the Shriners who took our toy offerings and, in turn, warmed us up with smiles, hugs, cookies, and coffee! Later that evening a ceremony was conducted wherein the groups all pooled the monies which had been raised that day, and over the past few months, and gave them to Al Aska Shrine Potentate Walter B. Bonner. The amount that evening (which will continue to grow as monies are still coming in) was almost $4,000. A traveling trophy was awarded to Kenai Peninsula ABATE for having raised the most monies. A trophy was also awarded to Cheryl Hamann, Kenai, for raising the most monies on her own. "Hey, Walt! Love the bike!" Now the hard work begins again with plans being formulated for the Second Annual Alaska Bikers for Children (ABC) Run. ALERT! - your "hot sheet!"